After certifying his suburban backyard as a wildlife habitat with the National Wildlife Federation, James Barilla learned that life with wild creatures is not always a peaceable kingdom. Faced with squirrels stealing his garden crops and opossums invading his crawl space, Barilla set out across the globe to see how humans and animals share the urban landscapes we both call home. From monkeys in India and marmosets in Brazil, to black bears in Massachusetts and the squirrels in our yards, this book provides a wonderfully in-depth look at the limits of coexistence. Barilla's prose is both authoritative and friendly--you immediately get the sense he's a man who knows his stuff, but at the same time the book is approachable for anyone, regardless of their academic background. For James Barilla and his family, the dream of transforming their Columbia, South Carolina, backyard into a haven for wildlife evoked images of kids catching grasshoppers by day and fireflies at night, of digging up potatoes and picking strawberries. When they signed up with the National Wildlife Federation to certify their yard as a wildlife habitat, it felt like pushing back, in however small a way, against the tide of bad news about vanishing species, changing climate, dying coral reefs. Then the animals started to arrive, and Barilla soon discovered the complexities (and possible mayhem) of merging human with animal habitats. What are the limits of coexistence, he wondered? To find out, Barilla set out across continents to explore cities where populations of bears, monkeys, marmosets, and honeybees live alongside human residents. 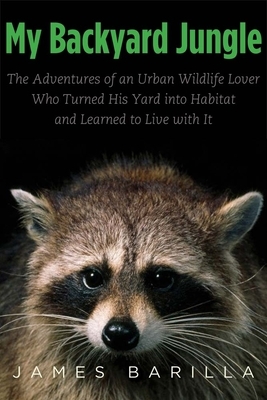 My Backyard Jungle brings these unique stories together, making Barilla’s yard the centerpiece of a meditation on possibilities for coexistence with animals in an increasingly urban world. Not since Gerald Durrell penned My Family and Other Animals have readers encountered a naturalist with such a gift for storytelling and such an open heart toward all things wild. James Barilla is associate professor in the MFA program of the University of South Carolina, where he teaches creative nonfiction and environmental writing. He lives in Columbia, SC.